A. A. Milne once said, “Organising is what you do before you do something so that when you do it, it is not all mixed up.” This fundamental and foolproof method of working is not unheard of but it’s easier said than done. It seems that while the majority of the workforce follow this rule, there is still a significant portion of issues that are reflected in statistics. Research shows that 50% of employees attend 2 - 5 meetings each week. If each meeting lasts for around 2 hours, a good 7 hours is spent on average each week. That’s a full day’s work! 46% of employees say most meetings focus on project status updates. That is a full day’s work spent solely on reporting. Reporting shouldn’t be the focus of meetings, progress should. All the meetings seem to be fruitless as 46% of employees are unsure about what to do next after a meeting. That’s not all, 20% of employees say that they hardly ever contribute to meetings. Finally, summing up these statistics is a good 35% of employees who are not satisfied with the work process in their company. Imagine the possibilities that could be if one were to start tapping into the resources that aren't being utilised the best way possible. Not only will an organisation benefit from the increased productivity, employees are able to go to work every day with a stronger sense of purpose, motivation, and inspiration. Planning resources can greatly reduce these negative numbers. Resource planning provides you a bird’s eye view of everyone’s tasks, responsibilities, project statuses and more. This automatically replaces project status update meetings, reduces the number of unproductive meetings, provides a sense of direction to every single employee, and increases work process satisfaction. The good news is that a full 65% of employees meet their deadlines most of the time. But that also means that 35% of employees don’t. Find a resource planning tool that provides you the option to allocate tasks and keep track of each task’s deadline. Whether you’re in a large conglomerate or a small start-up, having a go-to job scheduling software greatly simplifies processes and supervision. It’s really worth celebrating that 87% of employees consider themselves productive daily. For the other 13%, it’s easy to step up the game with a staff schedule software so that they are able to have productive work days with regulated effort from a manager. Resource planning brings great benefits to the table and it is an innovative way to plan, schedule and manage all of your resources at work. 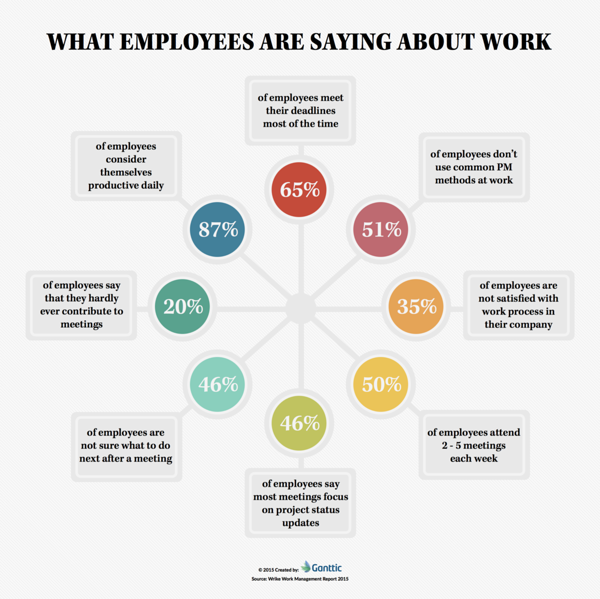 It is quite surprising that 51% of employees don’t use common PM methods at work. While traditional project management methods have brought various businesses to greater heights, parts of it are gradually becoming obsolete and replaced by better solutions. Resource planning is definitely one of these improved areas. Look into a resource planning solution today and utilise your resources better. Try Ganttic to up your employee resource planning game. You can claim your 14-day free trial here.